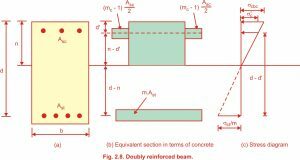 Types of problem in doubly reinforced beams working stress method: Determination of moment of resistance of the given section,Determination of actual stresses in concrete and steel,Design of the section. Determination of moment of resistance of the given section. Determination of actual stresses in concrete and steel. (iii) Material used grade of concrete and steel. (iv) Maximum bending moment or loading on the section. In the above equation, only σc as unknown and it can be calculated easily. (i) Span of the beam (l) and its dimensions (b and d). (ii) Loading on the beam. (iii) Material used-grade of concretes and steel i.e., σcbc and σst. Determine maximum bending moment (M) coming on the section due to loads (including self weight of the beam). Calculate the design constants k, j and R for the given materials. Calculate the area of tensile reinforcement (Ast1) corresponding to M1. Calculate the additional area of the tensile reinforcement (Ast2) needed to resist M2. Selecting suitable diameter of the bar, provide Ast. Determine the area of compressive steel (Asc) by equating the moment area of compressive steel (Asc) to the moment of the area of additional tensile steel (Ast2) about neutral axis. Moment of the area of compressive steel (Asc) about neutral axis. Equating them and calculating ASC. Calculate the number of bars required for providing Asc. Design for shear and bond is same as that of singly reinforced beam. Draw a neat sketch and give summary of design. Note : Design consideration for a doubly reinforcement beam as per IS 456:2000. (i) Maximum Compression Reinforcement (Asc): The maximum compression reinforcement in a beam cannot be more than 0.04 bD. (4%) of the gross cross-sectional area).